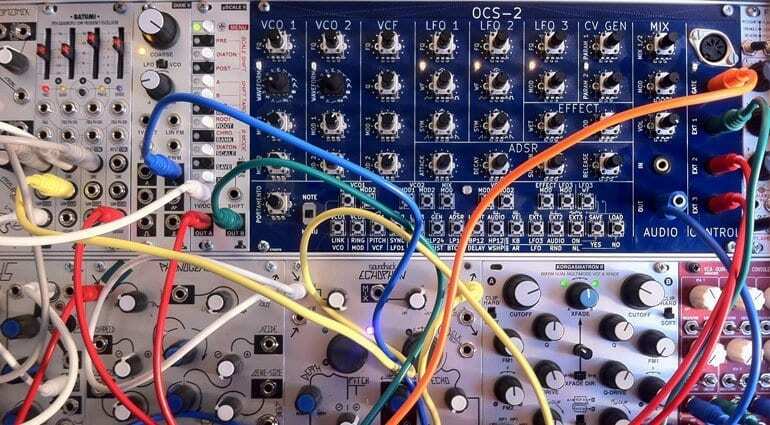 Just released by Nozoid the OCS-2 is a digital, semi-modular synthesizer in an analogue style. It’s small, rather utility looking even with the wooden ends, but has a lot of stuff going on inside that gives it a lot of sonic possibilities. Nozoid have packed in a load of features. 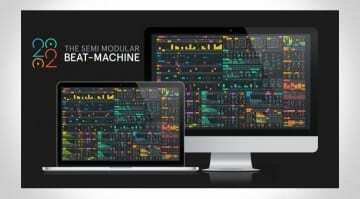 They talk about it implementing “state-of-the-art audio synthesis algorithms”. The audio examples are certainly very pleasing. There seems to be a knob for everything, 30 in total. 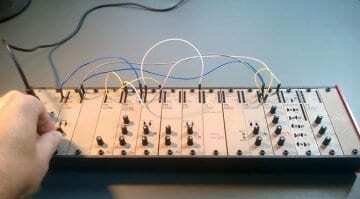 The 2 VCO’s offer 15 waveforms each and an extra setting to support audio input. They are mixed and routed through the filter, effects, amplifier with envelope and finally to the outputs. The two modulation knobs act upon the VCO frequency with the CV connected via the digital connection matrix. LFO’s can control the pulse-width and there’s a ring-modulation option for mixing the VCOs. The VCF is a custom version of the ubiquitous Moog filter. 24dB low-pass with resonance and self-oscillation. Distortion is kept under control by limiting the amplitude increase with high resonance. There are other modes for 12dB Low, Band and High pass filters. The LFO’s can morph between different wave shapes giving you a lot of flexibility between waveforms. The waveform knob controls the shape of the transition. Symmetry controls the ratio between rise and fall times. The frequency range offers time periods from 45 seconds to 1/40 second. There’s a 3rd LFO which is wired to the gate and can trigger notes. It has some addition rhythmic waveforms to provide a bit of movement. The CV Generator can be four things: An Attack/Release envelope; a dual LFO; a random generator; and a step generator. On the effects side you have distortion, bit crushing, delay and a waveshaper. At the bottom of the OCS-2 you have a bunch of micro-switches laid out like a 2-octave keyboard, which, of course, it can be. Its other use is as a digital matrix for patching modulators to destinations. They say that this will mean you’ll never run out of cables and you can also save the patch. I’m not entirely sure this is a positive thing. 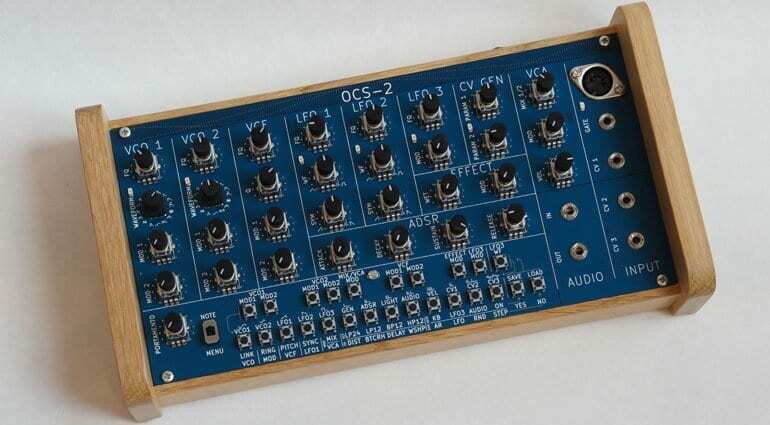 The OSC-2 claims to be semi-modular and yet you only have 3 audio inputs and a Gate input – hardly pushing the envelope in terms of modular patchability. Where you want to get your patch cables is into that digital matrix, but you can’t – they call it a “feature”. Well, you do have the 3 CV inputs in the matrix which is at least something. Rounding it off is a natty light sensor, just above the keyboard which can be patched to control whatever you like by waving your hand – nice. The OCS-2 is based upon the Arduino Due micro-controller. The software has been designed for easy modification and allows for some hacking. 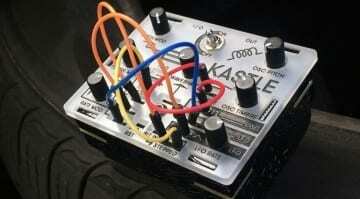 It is Eurorack compatible and will eat up 50hp of your case. It does look a lot like an electronics project – very competent but perhaps lacking that certain something to make it fabulous. I think the sound and usability is really very good. I imagine it’s the sort of synthesizer that benefits from a methodical approach of sitting down and working through it, step-by-step, feature by feature. In the demo video there’s a lot of digital matrix patching going on as opposed to simply playing with it. With the keyboard there, the sounds, the comprehensive modulation patching and the effects it’s certainly a fully featured little synthesizer. Perhaps the only thing missing is a sequencer – maybe someone could hack one in? The OSC-2 is available now from the Nozoid website for €499 plus €10 for the optional power supply, which you’ll need if you’re not racking it into a modular case. 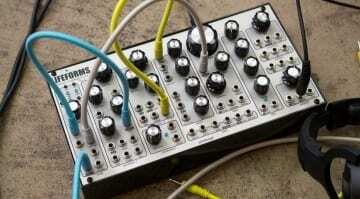 Pittsburgh Modular Lifeforms SV-1 Blackbox – The ideal portable modular synth?